At least five people were killed Thursday when a gunman opened fire inside the offices of the Capital Gazette, a newspaper published in Annapolis, a historic city an hour east of Washington. “There is nothing more terrifying than hearing multiple people get shot while you’re under your desk and then hear the gunman reload,” Davis said. “There are five fatalities that we know of. 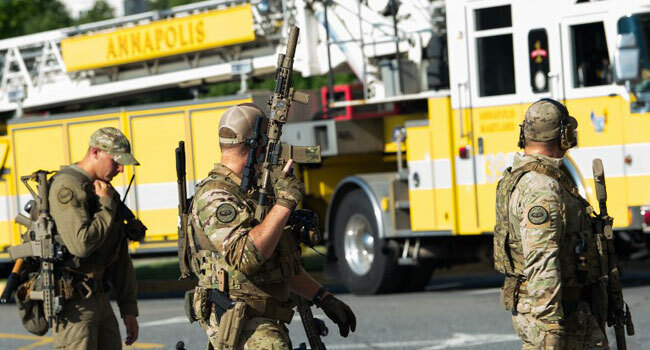 There’re several other persons that are gravely injured,” acting police chief of Anne Arundel county Bill Krampf told a news conference in the city, capital of the state of Maryland. Steve Schuhn, county executive, said a suspect was in custody and was being interviewed by detectives. 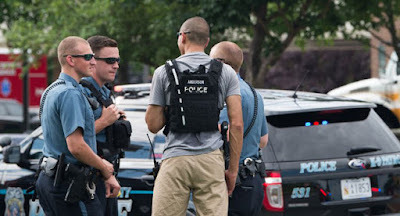 Lieutenant Ryan Frashure, a police spokesman, earlier told reporters police were “making sure there’s no other people that are suspects or helped the individual” and were combing the four-story office building for bombs. “We’re doing our very best to get the building secure,” he added. President Donald Trump was briefed on the incident and tweeted a message of support. “My thoughts and prayers are with the victims and their families. Thank you to all of the First Responders who are currently on the scene,” he wrote. Several other lawmakers weighed in, calling for an end to gun violence. A recent study found that Americans own 40 percent of the world’s firearms despite accounting for only four percent of the global population. Of the 857 million guns owned by civilians, 393 million are in the United States — more than all of the firearms held by ordinary citizens in the other top 25 countries combined, according to the Small Arms Survey. So far the results have been relatively modest. Florida has raised the legal age to buy firearms from 18 to 21, while Texas Governor Greg Abbott focused on mental health and improving school safety in his list of recommendations following the Santa Fe shooting in the rural southeast of his state. But he also called for requiring gun owners to report lost firearms and for allowing law enforcement to temporarily take away guns from people determined by courts to be “potentially dangerous” to themselves or others.